Made to satisfy the demands of the traveling photographer. Since the first commercially successful photographic process was announced in 1839, change and innovation has been constant - daguerreotype to wetplate to dryplate to film and finally digital - huge transitions that retooled the industry over its 170 year history. By the first decade of the 20th century, a great transition was taking place and a battle for technical supremacy was just about finished. 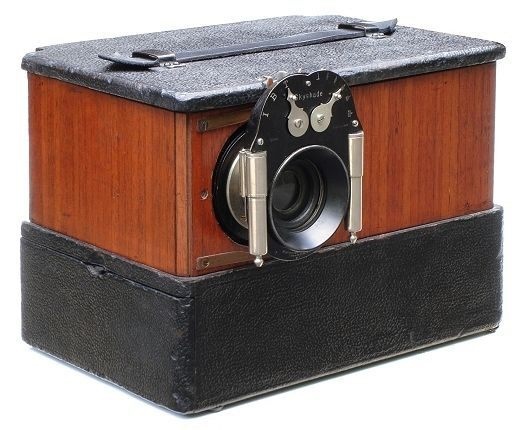 Small, portable film cameras were quickly replacing heavier folding wood plate cameras. Camera makers now faced difficult decisions in a rapidly changing market. It probably wasn't a question of "if" film would dominate, but "when" it made sense to abandon the dry plate market. Although glass plate photography would continue to enjoy a niche with photo-journalists well into the 1900s, one of the final nails in the dry plate coffin would come from a little known designer by the name of Oscar Barnack. In 1913, he would perfect a protoype 35mm film camera that evolved into the famous Leica series. Was the introduction of the Montauk Flexo-Front an "anochronistic last-of-an-era design created to stave off the onslaught of roll film" (as summed up by a well known collector), or did Gennert see a market for a portable multiplying plate camera? The Flexo-Front makes eight 1-3/4" x 2-1/2" images on a single 5" x 7" plate. Compared to traditional multiplying view cameras, it is significantly smaller and portable. The portrait lens is "able to make a full length figure at a distance of 12 feet." In some ways, the Flexo-Front reminds me of the equally odd Quta Photo-Machine. Both were offered at roughly the same time and have portable designs that make lots of small pictures. But their key difference was either shooting multiple images on a single plate or making separate small images. Regardless, both cameras quickly vanished from the market. The camera is in the upper half of the body. 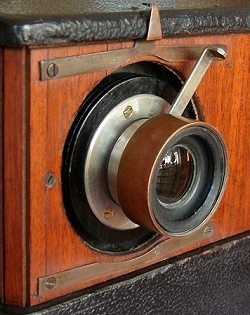 The lens and shutter, mounted on a tambour panel, slides side-to-side. 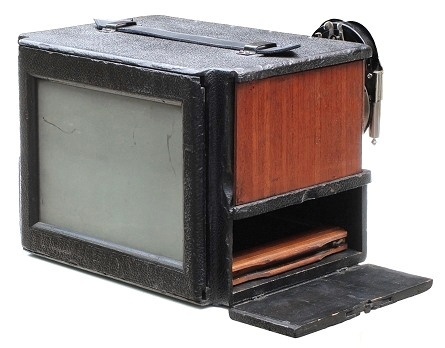 With four double plateholders stored inside the lower body, it has a capacity of 64 pictures. 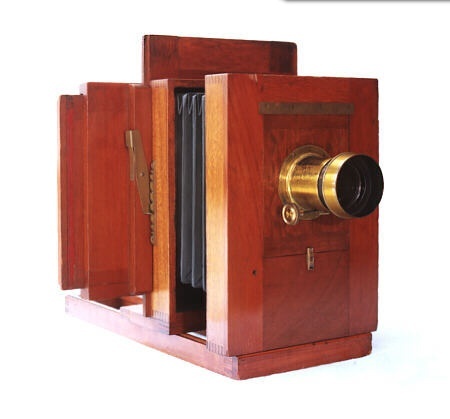 Given that the camera was rarely advertised and probably made for less than one year (only four examples are known), the public must not have accepted Gennert's vision of a camera for photographers, "who wish to make a great many small pictures, develop and print all at once and who requires a light and compact instrument." This camera was probably specially ordered for landscape photography. Instead of the advertised portrait lens, it is equipped with a helically focusing landscape lens paired with a Wollensak Skyshade shutter - a special purpose shutter designed to avoid overexposing skies, a problem common to landscape photography. The Skyshade shutter attaches to the front of the lens barrel. Focusing is done by turning a metal lever. Whether or not Gennert truly understood the direction of the market, the camera was a bold idea and gamble that did not pay off. Yet it is historically interesting as [probably] the last commercially sold multiplying plate camera; a fine representative of a photographic style that was never seen again.